Last major update issued on August 9, 2005 at 04:35 UTC. The geomagnetic field was quiet to unsettled on August 8. Solar wind speed ranged between 453 and 605 (all day average 500) km/sec. Solar flux measured at 20h UTC on 2.8 GHz was 86.4. The planetary A index was 8 (STAR Ap - based on the mean of three hour interval ap indices: 8.5). Three hour interval K indices: 22312213 (planetary), 33313223 (Boulder). Region 10792 added a small penumbra to the northeast of the trailing positive polarity penumbrae. This region has reversed polarities. Region 10794 decayed slowly and quietly. Region 10795 decayed further and lost nearly half of its penumbral coverage. Region 10796 developed slowly. A small positive polarity area is at the southwestern edge of the southern negative polarity penumbra. 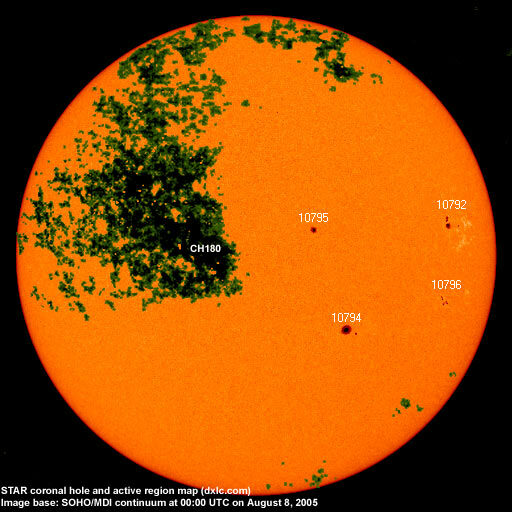 August 6-8: No obvious partly or fully Earth directed CMEs were observed. 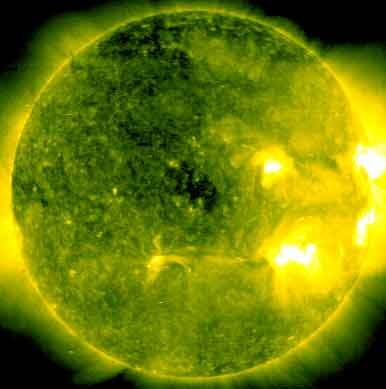 A trans equatorial coronal (CH180) will rotate to an Earth facing position on August 8-9. 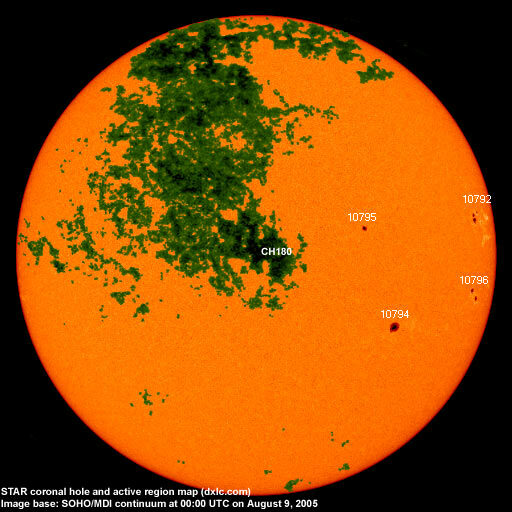 The geomagnetic field is expected to be quiet to unsettled on August 9-10 becoming quiet to active on August 11 due to effects from CH180. Long distance low and medium frequency (below 2 MHz) propagation along east-west paths over high and upper middle latitudes is poor. Propagation on long distance northeast-southwest paths is fair to good. Trans Atlantic propagation conditions are normally monitored every night on 1470 kHz. Dominant stations tonight: Radio Cristal del Uruguay and CPN Radio (Perú). Like the other Peruvian station Radio Santa Rosa on 1499.93 kHz was heard best 60 to 15 minutes before LSR. Radio Agricultura was noted on 1590 kHz with interesting signals on several other frequencies. After LSR propagation favored Argentina (710, 790, 870, 1070, 1110 and 1190 kHz had the best signals), Uruguay and the southeastern and northeastern parts of Brazil (580, 740, 970 and 1350 kHz were best). Before 02h UTC propagation was best towards the easternmost parts of North America and the Caribbean. Florida stations were noted on 1660 (WCNZ on top of WGIT), 1680 and 1700 kHz.